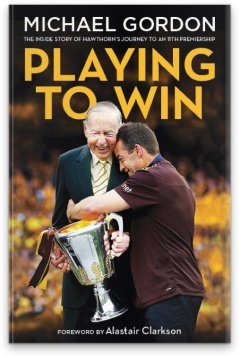 Playing to Win is an insider’s view of how the Hawthorn Football Club won its 11th premiership in 2013 and, in the process, established itself as Australia’s most successful football club over the past 60 years. From an unexpected flag in 2008 to redemption in 2013, Playing to Win captures the memorable moments that enrich this club’s already colourful history—a history that began as the perennial easy-beats of the competition. Award-winning author Michael Gordon takes the reader inside the private meetings at the key moments during the highs and lows of a five-year journey, offering extraordinary insights into the pressures and realities of elite professional sport. Based on unparalleled access and frank interviews with all the key figures, including Alastair Clarkson, Luke Hodge, Sam Mitchell, Jarryd Roughead and many more players and coaches, Playing to Win reveals how the ‘Kennett Curse’ was overcome; how Jeff Kennett considered dropping the coach to the VFL in 2010; and the coach's formula for transforming his players when they crossed 'the white line' in the 2013 Preliminary Final against Geelong. Playing to Win is compulsory reading for anyone who wants to understand how successful organisations work together to create a winning culture. Read a review of Playing to Win that appeared in The Examiner. Read a review of Playing to Win that appeared in the Wangaratta Chronicle. Read a review of Playing to Win that appeared in The West Australian. Read an extract from Playing to Win that appeared in The Age on Saturday, 15 February.